Walter Macken was born in Galway on the 3 rd of May 1915 at number 18 St. Joseph’s Terrace the youngest of three children. His father Walter Senior, formerly a carpenter, joined the British Army in 1915 and was killed the following year on the 27 th of March at St Eloi. The family therefore had to rely on lodgers and a small service pension to sustain them. Although a carpenter by trade, Walter Senior had other gifts: he was an actor and storyteller. The family remembers vivid descriptions of trench warfare in letters he sent home. Ultan Macken his grandson has all of the original letters, which he alludes to in his stage production, My Father, My Son. Walter Senior was often on stage at the old Gaelic Theatre in Middle Street Galway known as the “Racket Court”. This Theatre was still running in 1927 when Mícheál Mac Liammóir set up Galway’s famous Taibhdhearc, where Walter’s son would write, produce, and direct numerous plays. Walter inherited talents, which would make him famous. Walter attended several schools. The Presentation Convent for infants from 1918 to 1921, St Mary’s, a Diocesan College, 1923-1924 (where they trained people who wanted to become priests), and the ‘Bish’ or Patrician Brothers both Primary and Secondary from 1921-1922, and then from 1924-1934, where he took his Leaving Certificate. Whilst still at school aged 17 Walter joined the Taibhdhearc taking the leading role in a play called Íosagan, a dramatisation by Padraig Pearse of his own short story, produced by Frank Dermody. In addition to this he expressed an interest in sports, playing hurling and rugby for the famous Corinthians club. After finishing school Walter took up a job on the County Council, doing rates and accounts on a temporary basis. Walter however was not really interested in this as from an early age he had expressed a wish to be a writer. Walter was writing short stories, novels, and plays in exercise books from the age of eight. He carried on these works well into his teens. However, he destroyed these sometime between 1939 and 1947 when he returned from England to the Taibhdhearc, saying that this was only his apprenticeship. Walter did not stay long at the Council. He left what was really a temporary post in 1933 aged 18, and the Taibhdhearc became central to his life. By the time he met his greatest influence, Peggy Kenny, he was the Taibhdhearc’s leading actor. Peggy Kenny was from a different social background: her father owned The Connacht Tribune , and the family lived in the affluent Crescent area of Galway. Consequently, she had money and Walter did not (he was earning about 30 shillings a week). This would later cause problems for the couple. Walter and Peggy would not have met but for the Taibhdhearc. When they met up after rehearsals they would debate the merits of this and that writer, whilst on long walks. Although the couple had gelled immediately, their taste in writers differed considerably. (For example, Peggy liked Maupassant; Walter admired Ibsen and Chekov). Thus in some ways they were like chalk and cheese. Peggy however had a romantic ideal, that of being partnered with a budding writer. Walter was always telling Peggy he wanted to be a writer and she always had faith in his abilities. Then of course there was the fact that Walter was a handsome man renowned for his spellbinding stage voice. “You always did what your father told you”. One could also say that Peggy and Walter’s meeting was purely accidental. Peggy’s father, Tom ‘Cork’ Kenny, was a friend of the Taibhdhearc’s director Liam O Brien. The Taibhdhearc needed an actress for a part in a play called The Marvellous Life of Bernard De Menthon , which was to be put on for Eamon de Valera the Prime Minister, and the then president of Ireland Sean T. O’Kelly. Peggy’s father volunteered her and as she later said, “you always did what your father told you”. Peggy was fluent in both Gaelic and French and had a first class honours degree in English from University College Galway. She was ideal for the role of the mother of the lead, Walter. Walter would walk Peggy home to the Crescent after every rehearsal. They would discuss their future lives together on these walks. The difficulty however was that Peggy’s father did not approve of Walter. He had no ‘proper’ job to provide for the upkeep of his daughter. Eventually the couple decided that they would have to elope. The first play he produced. After their marriage on February 9 th 1937, they emigrated to London where Walter worked as an insurance salesman. This experience over a two year period later provided Walter with material for his second novel I Am Alone. Just before the war broke out in 1939 they decided to move back to Galway when Walter was appointed director of the Taibhdhearc. The Children of the Moon, was the first play he produced. That was the beginning of a long list of plays that he presented, directed, and acted in. Between 1939 and 1947 he put on 77 different productions. Then there was a famous trip to the Gate Theatre in Dublin where he presented for the Dublin public three different plays including a translation of The Shadow of A Gunman by Sean O’Casey. This period of his life was very important because he began to write regularly, both plays in Irish and pantomimes. He was involved with everything in the Taibhdhearc: producing and directing, but also building the stages, and designing sets and costumes. He also began to write in English. The Taibhdhearc became the most important school in his life because this is where he learnt his skill as a writer, and a dramatist. Walter was developing a style. During this period Walter wrote the plays Mungo’s Mansion (1947), Vacant Possession (1948), and his first novel Quench the Moon (1948), all published by Macmillan. Vacant Possession and I Am Alone (1949), his second novel, were plays, especially Mungo’s Mansion , Walter began to develop a theme, which would be prevalent throughout his life’s work: the story of ordinary folk, “the little people”. The theme of the play was drawn from the stories of families who lived in the squalid tenement buildings opposite the Taibhdhearc. Walter was developing a style, which involved the use of personal biography, elements of stories he was told, and personal traits of the people he met and lived with. For example: when Walter was working in the Taibhdhearc a man came in and told him the story of a young boy who had fallen into the sea by the Spanish Arch in Galway, and how he was saved. This true story was featured at the beginning of his third novel Rain on the Wind (1950), when the main character fell into the sea. After the huge success of M.J.Molloy’s The King of Friday’s Men, at the Abbey, in which he played the leading part of Bartley Dowd, Walter was invited to America by Michael Grace to play the role in New York, Boston, and New Haven. By this stage Rain on the Wind had become a huge success. It had won the Literary Guild award in America, which guaranteed sales of over 250,000 copies. Walter was becoming a success in all walks of life; as film studios, television and radio companies were all interested in him. He was offered a huge film contract, which consisted of $40.000 a year for seven years, as well as a free house. He turned this down saying that he had to go home to finish a novel ( The Bogman , 1952). With the success of Rain on the Wind , Walter could now concentrate on full time writing as a profession. On returning to Dublin six months later in 1951, Walter became almost totally committed to his writing. (He still took on some acting roles, and wrote articles for some newspapers.) According to his son Ultan his attitude to writing was based on the premise that a writer should not leave his own country, and that the life of a writer should be like that of a monk: through isolation, peace, and serenity he could be most creative. To further this, on the advice of his publisher, Macmillan, he left Dublin to find a place where he could discover this serenity. The house he chose was called Gort na Ganiv in Oughterard, 20 miles from Galway City, and about half a mile from Loch Corrib. In a secluded wild area of Connemara the property had a boathouse on the lake, which provided Walter with seclusion, as he partook of his main form of recreation, fishing. He lived there from 1951 to 1966. During the years he spent there, he wrote seven other novels The Bogman (1952), Sunset on the Windowpanes (1954), Sullivan (1957), Seek the Fair Land (1959), The Silent People (1962), The Scorching Wind (1966) and The Brown Lord of the Mountain (1967). In between times he took on a couple of film roles. In 1959 he was the leading actor in a film production of his play Home is the Hero written in 1952. In 1964 he took a leading role in a film adaptation of Brendan Behan’s The Quare Fellow. Additionally he was continually writing short story collections. The Green Hills and Other Stories (1956), God Made Sunday and Other Stories ( 1962), City of Tribes (1966), and, again posthumously, The Coll Doll and Other Stories (1969). All this as well as two children’s books, The Island of the Great Yellow Ox (1966) and The Flight of the Doves (1968), which was later turned into a major feature film. It was with his historical trilogy, Seek the Fair Land , The Silent People , and The Scorching Wind that Walter Macken was to he prove his authorial creativity. 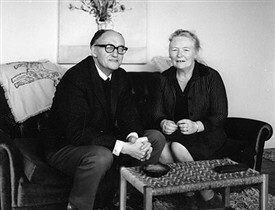 Earlier in their marriage Walter told Peggy that he wanted to write the history of his people from the point of view of the ordinary man. ” Before I die I want to do the history of our own people from the viewpoint of the little man, not all the big shots and the people who have done 100 things or anything like that.” (Peggy Macken, Cúrsaí , 1988)  He set out to do this by researching historical records and documents for two years before he wrote each book in the trilogy. He told Peggy that he wanted to be as exact as possible with the history in order for his work not to be criticised by what he called the so-called experts. Peggy Macken was always there for Walter. She provided him with security and serenity at home. Whether it was in Oughterard , America or Dublin he did not have to worry about run of the mill things. Throughout his life, although better educated than him, she came into her own as simply an advisor and supporter. The fact that she had a third level education would lead to claims that she re-wrote some of his work. Her television interview on Cúrsaí (1988) clearly shows this to be complete fabrication. The interview shows that even aged 79 she remained a sharp, well-spoken individual reflecting a well-developed intellect. She had given up a lot for Walter. Before they were married, Peggy had practically taken over the role of running her father’s newspaper, due to his illness. As news editor of The Connacht Tribune she had used Walter to write book reviews and articles. Yet even in their early days she had advised him: he would have to learn how to type, and it would be useful to have shorthand. He replied “But I never make notes Peggy”. Every day of his writing life. Each morning Walter would go into the living room or study in Oughterard at around ten o’clock. He would often smoke nearly a packet of cigarettes, walking round the table before he sat down to write. This was because whatever he was thinking about, whether it was a short story, a play or a novel he would have worked out in his head the night before. He would have worked out exactly what part of the plot he was going to write. He would write for maybe half an hour to three quarters of an hour and then when he was finished typing he’d call Peggy into the living room and he would read the material straight off the typewriter. In Cúrsaí , Peggy vibrantly enthused that if she cried Walter knew it was good. This was the kind of pattern Walter set for every day of his writing life. In early 1966, Walter and Peggy decided to move from Gort na Ganiv to the small Gaeltacht village of Menlo. They had only been there eight months when on 22 nd of April 1967 Walter died suddenly from heart failure. He was currently working on ideas for at least four new novels. He had told Peggy he was going to write a book about Ireland 15 or 16 years from ‘now’ called Turadh Mor , an ordinary down to earth, practical, non-romantic book, about people as they are. He was also working for the first time on a musical production, God’s Own Country. He was only 51 years of age.